Sea Gold is a Powerful Formula that Lasts-Longer than other Anti-Fog Treatments. It's Highly-Concentrated, so a Little-Goes-a-Long Way. It's Even-Effective through Multiple Dives. Use in any Water Temperature and in Any Conditions. It's Safe for Glass and Plastic Lenses, and won't Harm Silicone or Rubber Mask Frames. Avid Scuba Divers, Instructors and Professional Gear Testers alike agree: Sea Gold is the Best Anti-Fog Treatment out there. Rated #1 Tester's Choice by Rodale's Scuba Diving Magazine, use Sea Gold and you'll enjoy diving as it was meant to be: Completely Fog-Free. 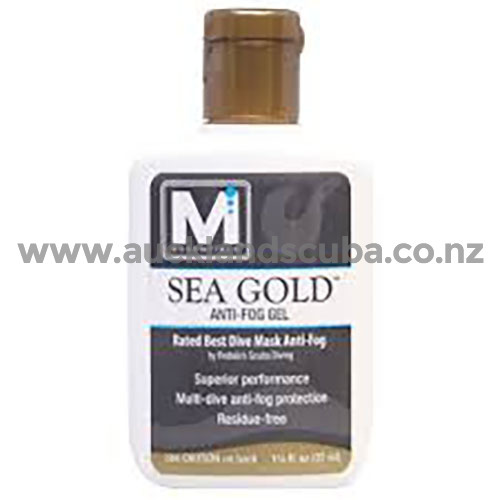 The Clear Choice in Anti-Fog Gels, McNett Sea Gold. Not recommended for swim goggles. Sea Gold is Non-Toxic, Biodegradable and Alcohol-Free, comes in a Convenient 37 ml Squeeze Bottle Applicator.